Unfortunately, due to sales rights restrictions, we cannot offer German Motorcycles of WWII for sale in your country. The Germans developed and used the motorcycle as an instrument of offensive warfare, perhaps more than any other nation in WWII. The major tasks of these units were mopping-up for the following troops and employment as an advance guard, surprise raid-like attacks against an opponent's flanks and rear, as well as pursuit of the opponent. A wide variety of machines were deployed for these tasks, both impressed and adapted civilian models, as well as variety of purpose-built military motorcycles. 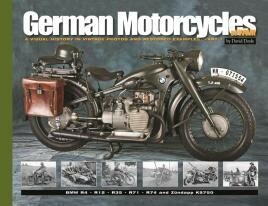 This distinctive reference combines rare vintage photographs with photos of superbly restored German WWII motorcycles. The first of a multi-part series on the subject, this volume features large, full-color detail photos of the BMW R4; R12; R35; R71; R74 and Zündapp KS750. Only the very finest examples of these motorcycles were sought out for inclusion in this title. This will prove an invaluable detailing guide to modellers. Highly recommended. Overall, this book proves to be a valuable source of information. It would be a nice addition to the modeler's library, and I appreciate that authors focused on several bike types. Whether you have the models that you intend to use this book for reference, or have an interest in the subject, this book will give you all the reference pictures and some besides, as well as some inspiration for dioramas. The preserved examples are of particular high quality, and as close to an in-service machine as you could wish for, although probably a bit cleaner! Highly recommended. The detail in here is ideal for modellers and good references for anyone who has a preserved example of their own. With large scale kits such as the 1/9 models from Italeri (originally by ESCI) these are very handy for helping add any final extra details to a model. David Doyle's first volume on German Motorcycles is beautifully illustrated and forms an important part of the military transport literature of WW2.